Today’s marine businesses have to manage and prepare for the actions of “the other guy” as much as they have to manage their own operations. While businesses often ask their customers, tenants, and subcontractors to carry insurance, they often do not carefully delve into insurance specifi cs to assure that gaps in insurance coverage don’t exist, that limits are adequate, or that they have the right coverage for their operations. Marina and over the years he built quite an operation and a strong reputation to go with it. The marina, like most busi- nesses, catered to their customers, and in this case that was the recreational boat owner. To provide their customers with the best of marina experiences, Seashores Marina sub-let out a 2,000 sq. ft. building to a four star restaurant called Bar- nacle Bills, and contracted out their boat fueling operations and their boat repair operations. Boat owners who rent slips at Seashores could entertain friends, fuel up for a fi shing trip and have their boat maintenance handled right on site. Like most marina operators, Charlie required his tenants to provide him with Certifi cates of Insurance which name the marina as an Additional Insured. What’s important to note about Certifi cate of Insurance is that they just prove that the business has insurance coverage at the time that they handed over the certifi cate. There are typically no further alerts or notifi cations if a tenant revises coverage or a policy is terminated for any reason. Charlie, however, trusted his tenants and did not think twice about it after the fact. One day, a restaurant patron slipped and fell in the park- ing lot outside Barnacle Bills restaurant. The patron fi led a claim against the restaurant for personal injury, and while they were at it, included Seashell Shores in the claim as well. The restaurant’s insurer defended both the restaurant and the marina, but after the claim was settled, the in- surance company subrogated the claim against the marina that was responsible for keeping the parking lot in good repair. At the end of the day, the marina’s insurance policy was hit with a loss, and Charlie learned a lesson. Subrogation, and that the marina would be provided with a Notice of Cancellation (NOC) should any of their insur- ances ever be cancelled or substantially changed. Either way, Charlie felt good about his new contract. Accidents happen but now, he felt more protected with his current contract and with the requirements he placed on his restaurant tenant. 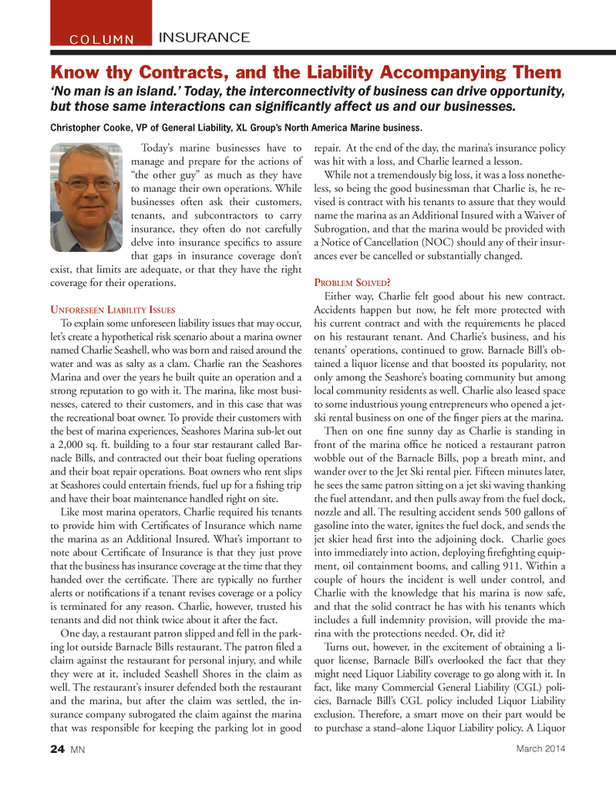 And Charlie’s business, and his tenants’ operations, continued to grow. Barnacle Bill’s ob- tained a liquor license and that boosted its popularity, not only among the Seashore’s boating community but among local community residents as well. Charlie also leased space to some industrious young entrepreneurs who opened a jet- ski rental business on one of the fi nger piers at the marina. Charlie with the knowledge that his marina is now safe, and that the solid contract he has with his tenants which includes a full indemnity provision, will provide the ma- rina with the protections needed. Or, did it? Know thy Contracts, and the Liability Accompanying Them ‘No man is an island.’ Today, the interconnectivity of business can drive opportunity, but those same interactions can signifi cantly affect us and our businesses. Christopher Cooke, VP of General Liability, XL Group’s North America Marine business.